World famous Bondi Beach is located eight kilometres from the city. The diving at either end of Bondi Beach is excellent. 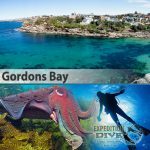 However, the best dive site is at Ben Buckler Point at North Bondi. Drive your vehicle down Ramsgate Avenue to where the road splits into two. Take the lower road and you will find two small car parks just above the rock platform. These are now always full as the council has started to charge for parking in the streets and it appears residents who do not have exemption stickers park here now. 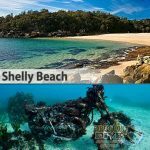 Sydney residents would be aware that the waters around Sydney that were previously severely polluted by sewage are now much cleaner. 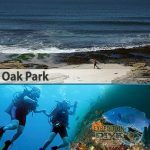 At the time of writing, there are only two main sewerage outlets that still pour sewage into the ocean, these being located at Potter Point near Cronulla and Diamond Bay near Vaucluse. The three main sewage treatment works at Malabar, North Head and Bondi have all now switched over to the disposal of the effluent through deep-water ocean outlets that deposit it three to four kilometres off-shore. The final treatment works to come on-line was the Bondi Sewage Treatment Plant. 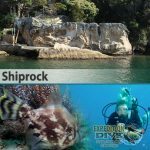 Prior to its connection in July 1991, the North Bondi and Flat Rock dive sites could only be dived in the right weather conditions when the sewage was blown away from the dive sites.